Starline track busbar is a modular, build as you need it, high-density electrical distribution system. It has been designed to meet and exceed the rigorous reliability demands and thermal requirements of mission-critical facilities including datacentres and server rooms. Starline busbar trunking power distribution allows you to provide all your racks and servers with power – flexibly and securely. The track busway can easily be installed from the ceiling, under a drop ceiling or under a raised floor (plenum). If redundancy is required parallel busway tracks can be placed next to each other. The male connectors of the busbar allowing for either 3 or 5 pole connections is inserted into the mating conductor. A twist with the installation tool presses the copper bar into a spring connector which provides constant pressure without the need of screws or bolts. 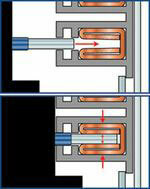 Additionally the modular design of the busbar system allows for easy reconfiguration, extending or dismantling. Reliability – is the backbone design criteria for all STARLINE track busbar systems. The unique compression connection concept at the connection points ensures that all connections run cooler than the conductor busbar itself. Starline’s patented technology provides a system that requires no routine maintenance or downtime. Starline has been installed in major mission critical data centres and server rooms throughout the world including Cisco and SUN Microsystems to name only two. Scalability – is a necessary and an intergraded part of the Starline busbar power distribution system allowing growth or changes in a matter of minutes, not weeks or months. A maximum protection of your investment is given, as you only have to invest in the components that fit your individual requirements. If your system changes or you need to reconfigure, an additional plug-in module can be added at any time. There is no need to pull whip cables, change the power distribution panels or shut down the system. Track busbar power distribution systems, like Starline, are designed for the long term and with change in mind. This reduces residual costs and allows the reusing of unneeded parts. Flexibility – means to you that you can configure the Starline busbar power distribution system exactly to you’re your corresponding needs. We offer busbars with 100, 225 or 400 Amps and up to 415 Volt. Single or three phase connectors can be located next to each other on a single track. Cost Effective – The Starline busbar system costs about the same as installing a traditional power distribution panel with cable whips. The efficiency comes in when changes are made or when expanding your data centre. Your qualified IT staff can add, remove or exchange power plug-in modules in a matter of seconds. Historically, that would take weeks, now it only takes seconds at a fraction of the price. Note: Plug-In units with T5 in the part number can be used in all 250A, 400A and 800A Starline Busway systems. More information about the entire Starline Busbar Distribution Solution.